Creating dummy variables for several categorical variables by basic syntax is usually not hard. However, applying proper variable labels to the newly created dummy variables requires quite a bit of effort. The tool presented in this tutorial will take care of this -and some other issues- more easily. Make sure you have SPSS version 17 or higher and the SPSS Python Essentials properly installed. Download and install SPSS Create Dummy Variables Tool. Note that this is an SPSS custom dialog. Go to Utilities Create Dummy Variables. Fill in the name(s) of the variables you'd like to dummy code. This will create dummy variables with variable labels and value labels automatically applied to them. Note that their variable names consist of (the original variable name) + a suffix + (a numeric index). Let's say we'd like to dummify “education_type” from employees.sav. First note that 5 value labels have been defined for this variable. This can be seen under variable view as shown below. Using the dummy variables tool results in 6 new dummy variables, the variable labels of which contain the values and corresponding value labels of the values they represent. This is shown in the screenshot below. First, note that the suffixes for the new variable names (for instance, “_d1” in our example) don't have any substantive meaning. That is, “_d1” says nothing about which value this variable represents (in fact, it represent a system missing value in our example). The actual meaning of the dummy variables is solely contained in their variable labels. Second, a dummy variable will be created for each distinct value that's actually present in the original variable, regardless whether a value label has been defined for it. A value that does not occur in the original variable (but may have a value label nevertheless) does not need a dummy variable and is therefore skipped. Instead of using the Custom Dialog we just discussed, you may click here for an SPSS Python syntax version of this tool. It includes the creation of some nasty test data we used for testing the tool (containing labelled and unlabelled string variables, user missing values, system missing values and so on). ********00. CREATE NIGHTMARE TEST DATA FOR DUMMIFYING. do repeat @v = v3 to v4. if $casenum = 5 v3 = $sysmis. missing values v3 v4 (2). if $casenum = 4 v3 = 4.
value labels v2 'cat' 'CAT!' 'rat' 'RAT!'. 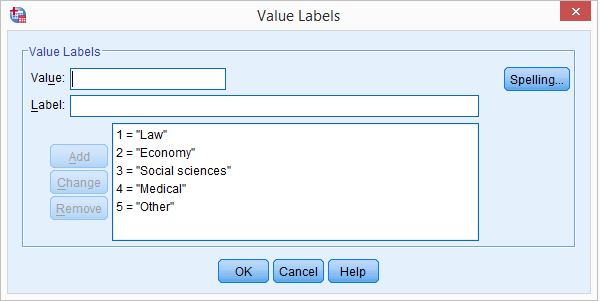 value labels v3 0 'No' 1 'Yes' 2 'Don''t know' 4 'Don"t know'. value labels v4 0 'Bad' 1 'Good' 2 'Not applicable'. *match files file */keep v1 to v4. Next tutorial: How to Mean Center Predictors in SPSS? Hi Amna! Almost right: you have to tick "Include the SPSS Python Essentials" during the installation process. If you don't, then you have SPSS without the Python essentials and many users have a lot of trouble installing the Python essentials afterwards. Happy to hear the problem's been solved for now! Right. Well, I always encourage SPSS users to install the SPSS Python essentials because many tools -the dummifying tool but many other too- require it. Now, the dummifying tool is a nice time and effort saver but you don't really need it. If you can't use it for whatever reason, you can always compute the dummy variables manually as explained in computing dummy variables.